FEATURE: (5.10.07)-- [Updated: 2:50p, PDT on 5/10] With all the news going around the web on other Mac-centric websites about forthcoming retail Apple Stores debuting across the nation--whether opening soon or currently being constructed--there's one place where Apple's been beefing up their presence in a significant way, and no one seems to be noticing (except us). As previously reported here on PBCentral.com in December of 2006, Best Buy is selling Macs once again. In recent weeks (to this columnist's observations, who is a weekly visitor to said store, so consider it "fact"), the spaces/sections reserved exclusively for Apple products in-store have received a major makeover. The makeover is so major that when you first come across it, you might think you took a wrong turn somewhere. Once you step foot into the new Apple section, you might think you were magically transported to a regular Apple Store, except this one's a mini version. Instead of notebooks and desktops being placed on a semi-wobbly store shelf with other Apple-branded accessories--software, connectors, keyboards, and mice--displayed at the other end, now all Apple products are prominently displayed in their own stylized kiosk. An almost store-within-a-store concept, except what's missing are Apple employees eagerly waiting around to help you (at least, not yet). Prior to this new setup, each Best Buy store seemed to be responsible for choosing the way they arranged and setup their Apple merchandise and had complete freedom in doing so. Through observation, using two Best Buy stores in the San Francisco Bay Area as an example--located about 25 minutes away from each other, in opposite directions north and south--their methods for marketing were as wide as the Bay itself. 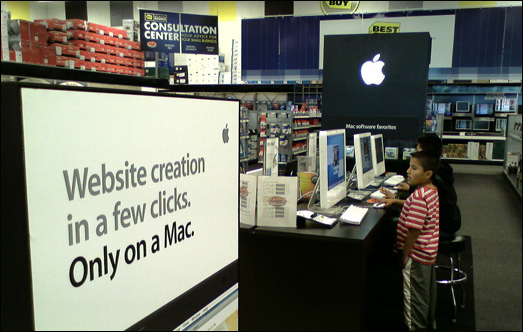 While the Union City, CA location (Store #144) had one half of an aisle dedicated to its Apple products which were prominently displayed amongst the other computer products nearby, the Emeryville, CA location (Store #499) "buried" their Apple products away from the competition. To be exact, you had to stumble across their Apple section since it was housed in between a narrow aisle where they sold their printers and peripherals. (It is interesting to point out here that CompUSA--one of two that survived the store closings in the Bay Area--resides in the same shopping center as Best Buy #499. Three minutes down the road is the Apple Store, Bay Street, also in Emeryville. [note: Emeryville is located next to Berkeley and Oakland] ).